I lied when interviewed for our office’s newsletter. I could tell I was losing the interest of the designated “journalist” as I detailed all of the improv, sketch writing, short filming I had recently done. So when she asked “are you currently doing anything? like now?” I felt I should say, “yes” even though “yes” was really more a “no”. I said I had been writing, which while not sketch writing was still a mostly true statement – I wrote emails. It counts! I implied I was planning on performing, since I performed quite regularly at my desk for the “amusement” of my coworkers and myself. Those laughs are sincere. I just know it! But it was all a lie. I wasn’t doing anything. I wasn’t writing. I had no plans to perform ever again. That’s when I was approached to be part of a show celebrating Shakespeare. Would I like to be part of a puppet sketch? I waffled. I offered to carry them with promises I was a really great and reliable carrier. This is true. Well, unless it’s really heavy and then I’m an equally accomplished whiner. The other part of my offer, should I be turned down on the carrying gig, was to volunteer to be in the show and say one line. That line was, “mailbox”. I know, it sounds random, but in my Puppeting 101 class it was an exercise we used to move our puppet around a space and speak. Basically, your puppet believes everything it sees is a mailbox. They get excited when they see it, they yell, “MAILBOX!! !”, run over to it and usually look a bit defeated as they sigh, shake their head and say, “no mail”. (It’s a little sad. For the record, most puppets would really like to find something in that ever empty box. If you know a puppet, write it a letter.) The sketch writer/performer/orchestrator considered this and came back with a sketch where I had one line. I got to say “Shakespeare!” Which is “mailbox” only in early modern English (what Shakespeare wrote in – your fun Shakespearean fact for the day). I’d never been in a real show. Sure, I’d done student shows and then there was our show this summer, where people read my words, but not a show where people who I hadn’t bullied might attend and pay real money. These future audience members would doubtlessly have higher standards. But despite all doubts I performed last month as part of a puppet cast that taught Shakespeare 101 using my best Jean Luc Picard voice (sure, you think that’s just Patrick Stewart, but there’s a subtle and distinct difference… in my head.) with a puppet I decided was Puck. I did this for six shows where audience members laughed and people called out “Shakespeare!” to me after the show. It was great fun, I met some great people and it that had the added benefit of not making me a complete liar for the office newsletter. Whew! Karma bullet dodged. Like the rest of the troupes that appeared with us celebrating Shakespeare, I grew up with the Muppets. I’ll even admit that Jim Hensen is the only celebrity whose passing brought me to tears. In my mind his death meant that Kermit had passed away as well and I was beyond heartbroken. I completely believed in the Muppets and their magic So, needless to say one of the fun things i loved about having a puppet on my hand was seeing the effect it had on people – on the audience and on the cast. The Richard the III’s (there were more than one – UK parking lots were very busy this season) whose faces would melt as they’d wave to each puppet and softly say, “hello”. The Rosencrantz who cheerfully inquired, “Puppet! What time is the show?” and waited for the puppet to respond. 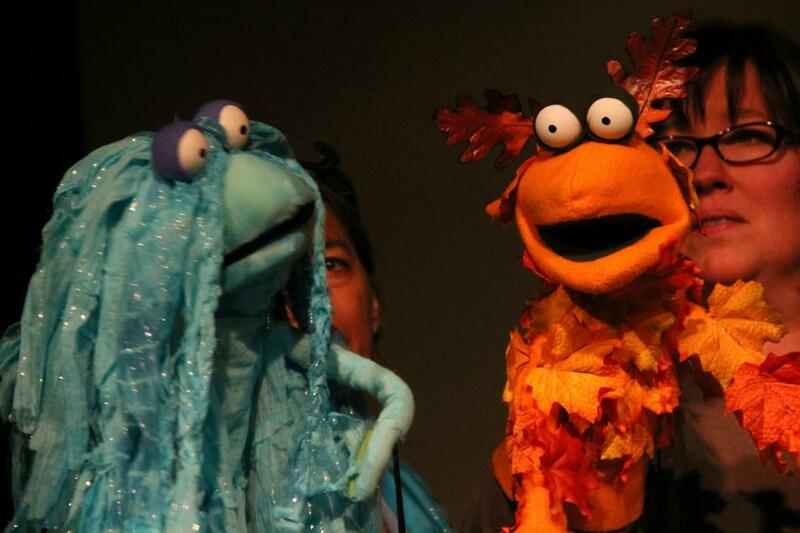 The audience member who stopped me and said, “the puppets were the best!” – not, “you guys” and all the people who’d just pause when you’d place them on your arm and their countenance would soften a wee bit upon seeing them. They’re magical. I was proud to be a part of this group that brought such joy. We few, we happy few, we band of [puppeteering] brothers. This entry was posted in Me, Random Thoughts and tagged dystheatre, puppets, shakespeare.